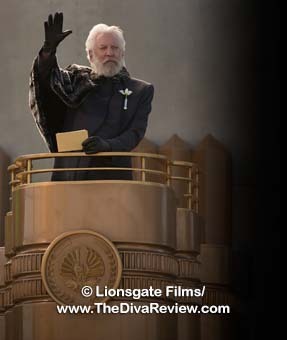 In different hands, how would chapter two of The Hunger Games trilogy fare? The big hit of last year was initially compared to its YA-adaptation predecessor, Twilight, but here was an unexpected similarity as that series’ directors also changed from films one to two, and in that case, all for the better. The primary Hunger Games entry differed from Twilight in that it was actually good, so the director switch was more precarious. 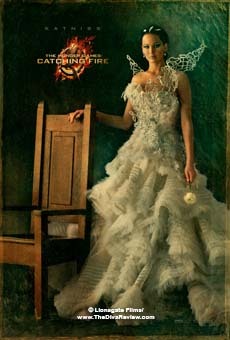 Happily, and unlike the books on which they are based, the second installment, Catching Fire, surpasses the first. Celebrity has been an odd fit for Katniss Everdeen: It’s meant that she and her family can move out of their District 12 hovel and live in the security and relative comfort of Victors’ Village. The food, once so scarce, is plentiful, and now Katniss mostly hunts to provide for others and as a respite from her new status. 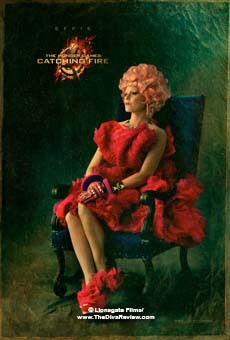 However, despite her incredible win at the 74th Hunger Games, all has not been glory and roses. Katniss’ strategy to save the lives of both herself and her District 12 counterpart, Peeta Mellark, has flown in the face of the Panem government. 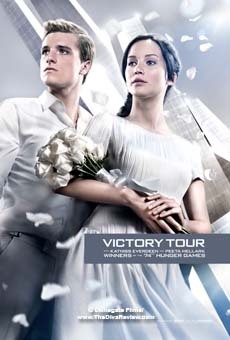 Their dual victory was based on Peeta and Katniss selling the story of a young couple madly in love who would rather die together than be separated by the Games. 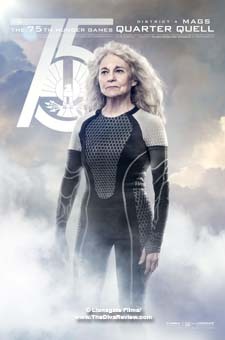 Their survival has sown seeds of rebellion across Panem that the Capitol has endeavoured to put down with a heavy hand. 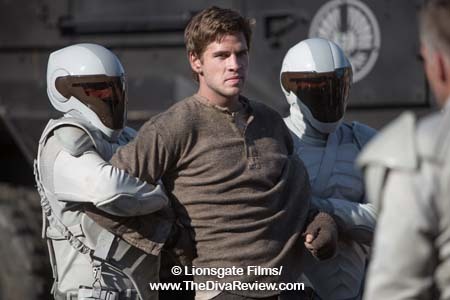 That life-saving performance created tensions at home; complicating Katniss’ relationships with both Peeta, who wanted the act to become reality, and Gale, her District 12 hunting buddy and presumed (yet ever-so-chaste) squeeze, while enraging Panem’s President Snow by forcing him to change the rules. Snow makes an impromptu visit to the Everdeen home, warning Katniss to play her little heart out during her victory tour around the 12 Districts. She’d better convince the entire country that it was true love that made it possible for the pair to survive and not outplaying the government, because that might show the Capitol’s weakness and create similar ideas in the minds of the unhappy populace. 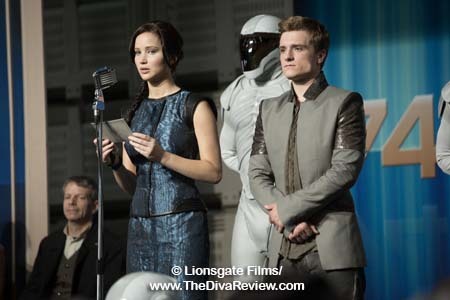 Katniss and Peeta are reunited with their caretakers, permanently soused former victor, Haymitch Abernathy, and Panem’s fashion plate, Effie Trinket, for the tour. The alleged teenage lovebirds, who have barely spoken since the Games, are expected to play blissful bubbleheads grateful to the government for fostering their romance. 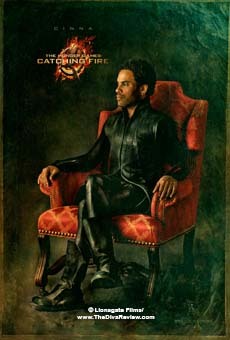 The trouble is Katniss isn’t that great of an actress. 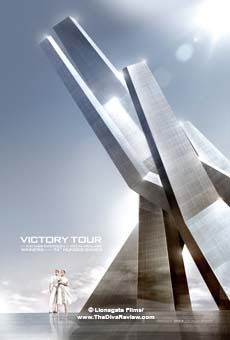 Their stop in District 11, home of her Games friend and surrogate sister, Rue, who was slaughtered before Katniss’ very eyes, causes her to momentarily drop the besotted dingbat mask, inspiring a tiny gesture of rebellion that is put down with Panem’s hammer; storm troopers, executions, the works. 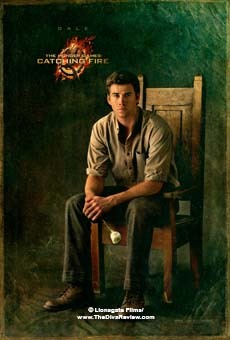 It’s an action that reverberates in District 12, as well. The tour has only made people angrier and upon the kids’ return home, Snow rewards them with a town overrun with brutal Peacekeepers and public floggings. There is also the advent of the Quarter Quell, a special version of the Hunger Games, which will reunite previous champions for a fight to the death with only one victor left standing. Before they can even kiss their loved ones goodbye, Katniss and Peeta are whisked away to the Capitol to once again fight for their lives, this time against older warriors who all know what it is to walk over the bodies of others to survive. 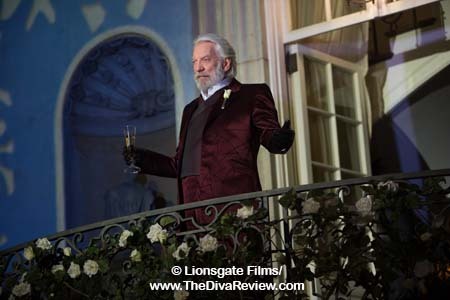 Picking up shortly after the previous film ends, Catching Fire grabs a brisk pace and sticks to it, while feeling larger and more epic than the last movie. 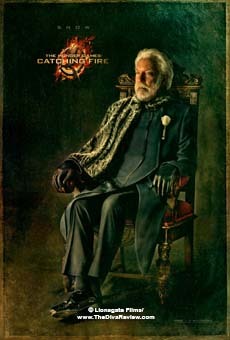 The scope of the story; going through the different settlements and the ominous threat about Districts that no longer exist, ups the ante on how dangerous President Snow is and what he’s willing to do to keep order. 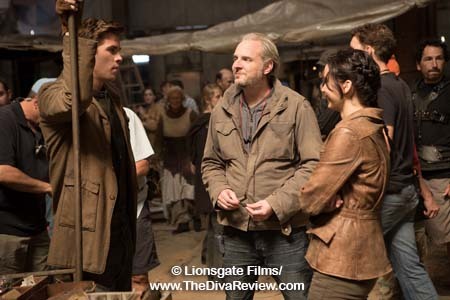 There is less concentration on the lovey-dovey triangle between Katniss and her adoring men. That is just ducky considering the life or death circumstances, which are much farther reaching and more urgent here than in the first film. 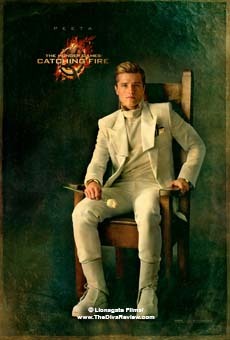 It isn’t just Katniss or Peeta’s lives at stake, it’s their families, friends, their entire town and any District unwise enough to look up to their rebellion. 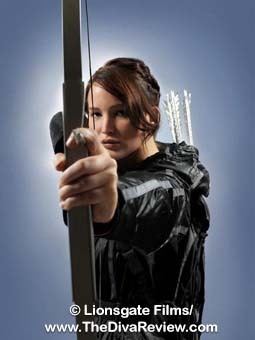 The pin Katniss wore in the first Games has become a symbol of the underground and Mockingjay graffiti turns up in railway tunnels. The two kids fighting for their lives represent much more than they know, and the extent of their influence is a key to this film. 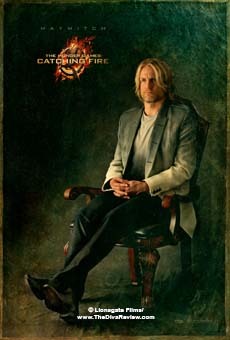 Katniss and Peeta have friends where they couldn’t imagine, even in the arena, where Haymitch’s old associations pay off big time. No one is pleased about the blatant execution of champions, who were promised exclusion from the Games for the rest of their lives; most especially the warriors themselves, so it doesn’t take much to convince them to support the pair of youths who have become a symbol of the resistance. The other players are brought to life excellently and it’s thrilling to watch them tentatively bond to try to get out of the Games alive, or at least give Panem’s government hell while dying. The ensemble this time is really what makes Catching Fire a bigger success, taking the sole focus off the still not-all-that-likable Katniss, who remains a taciturn and stubborn creature that’s often slower on the uptake than necessary. 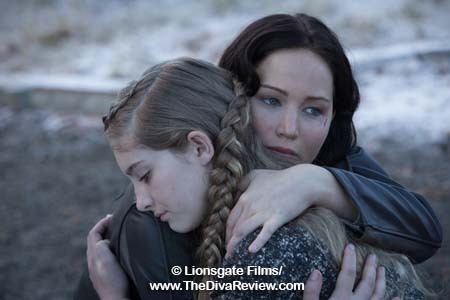 (It is still a miracle of both films that the movie Katniss is miles more agreeable that the stroppy, foolish Mary Sue in the novels, for which we continue to thank the screenwriters and Jennifer Lawrence’s humanising portrayal.) 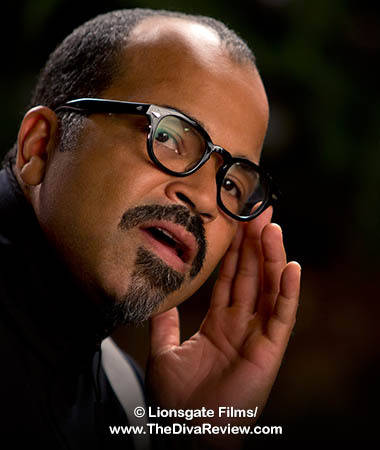 Standouts in the strong cast of prior victors include Jeffrey Wright and Amanda Plummer as the ultimate genius tech-heads, Beetee and Wiress. The pair, incomprehensible to anyone but each other in their scientific gibberish, just might hold the key to escaping the Games alive. 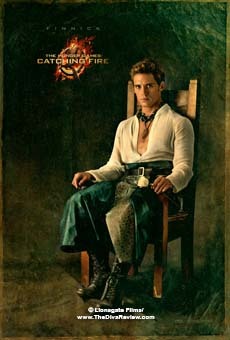 Sam Claflin plays Finnick Odair, a charismatic champion with golden, movie-star looks and a tragic past. Running around with a trident and jumping in and out of water as much as he does here, it’s amazing there isn’t an Aquaman script with Clafin’s name on it. 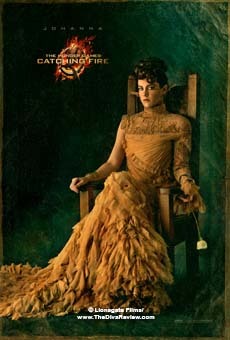 Jena Malone plays the very angry victor, Johanna Mason. 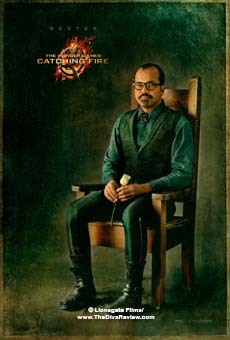 The loose cannon is so unabashedly bitter about being called back, it’s impossible to know what she’ll do, which puts the wary Katniss even more on her guard and makes her less likely to go along with the victors’ plans. 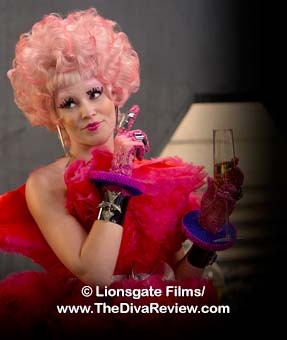 A special mention must be given to Elizabeth Banks, who comes into her own as the Capitol’s main fashionista, Effie Trinket. 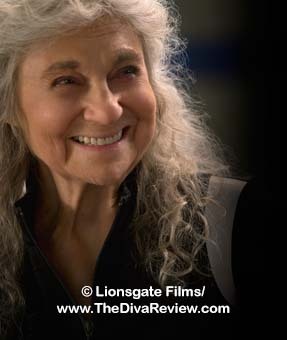 This time, and wholly appropriately, she’s given more hilarious, out-of-place, one-liners, more fabulous over-the-top costumes and hair, and some unexpected character development as the über-maquillaged caretaker really has come to cherish her charges. 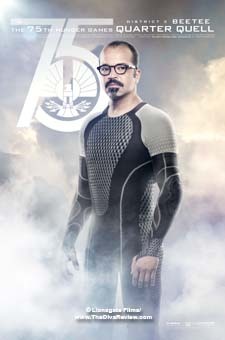 One of the film’s two off notes would surprisingly be Stanley Tucci, not for reprising the indigo-coiffed Caesar Flickerman, but for the amount of on-screen time his Panem television host is given. Very long minutes are settled upon his scenes waiting for Tucci to do something funny with the already outrageous character and it drags the momentum badly. 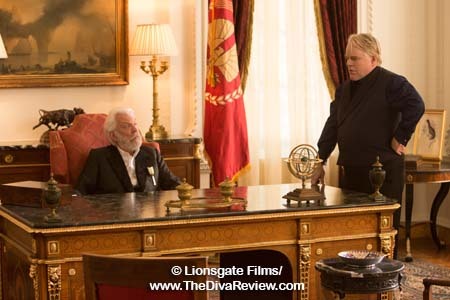 The other oddity is the performance of Philip Seymour Hoffman as the new Games creator, Plutarch Heavensbee. 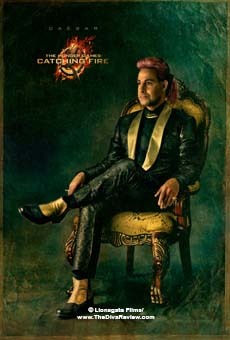 While everyone in the cast is made up in some way to reflect their character; clothing, makeup, hair, something - Katniss’ wedding dress/Mockingjay gown is a magnificent symbol of rebellion, and this time the flamboyant designer, Cinna sports a fetching headscarf to offset the fact that it’s still just Lenny Kravitz with a little gold eyeshadow - Philip Seymour Hoffman just looks like Philip Seymour Hoffman. In a perfectly ordinary blazer and chinos, that actor looks more like he’s just walked in from casual Friday at Mutual of Omaha than the fashion-forward future of The Capitol. What’s even more jarring is that he doesn’t even attempt to act; he’s reading lines and waiting for his paycheck, no effort at all. Thankfully, he’s not on for terribly long. Still exciting despite not being as futuristically special effects-infused and a bit lighter on the action set pieces than movie one; there’s a lot more to hold the attention in Catching Fire by way of notable performances and storyline. Things are heating up in the long view and if the quality of the filmmaking continues into Mockingjay, I’ll be thrilled to see how it ends. 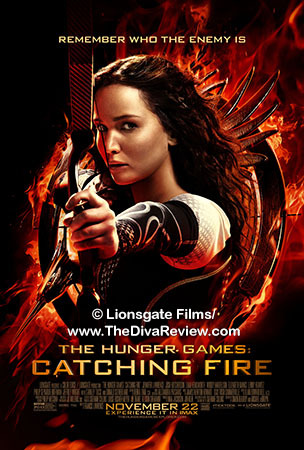 Click here for our review of 2012's The Hunger Games.